Founded in 1967, Confidence Golf has been designing golf clubs for new and improving players that help them master the game. 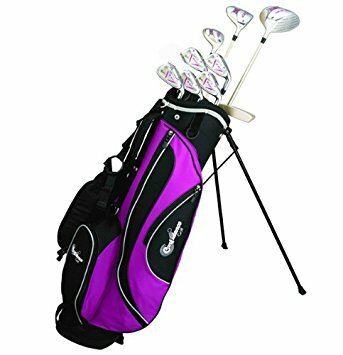 The Confidence Golf ESP Lady Graphite Hybrid Set and Stand Bag features all of the tools needed to improve quickly: 2 woods, a hybrid, and 5 irons all made of lightweight graphite material with an innovative design specifically for women. Rounding out this set is a padded stand bag with auto pop legs. The Confidence Golf ESP Lady Graphite Hybrid Club Set and Stand Bag features 2 woods: a Titanium Matrix driver and an ESP 3 wood both with graphite shafts designed with nanotechnology. A 3/4 hybrid is a great choice for ladies, who will find it easier to handle than a traditional 3 or 4 wood. The 6, 7, 8, 9 irons and pitching wedge are also made with graphite shafts; graphite is a preferred club material because it has a lighter weight and conducts fewer vibrations. Finally, the set includes a slim putter. Clubs fit nicely into the divided stand bag made of tough material and outfitted with pockets and padded carrying straps. The graphite shafts, range of clubs, and quality stand bag are what makes this set a winner. Reviews of the Confidence Golf ESP Lady Graphite Hybrid Club Set and Stand Bag from new and less experienced golfers have been very favorable. Buyers appreciated the women-friendly design of the clubs, their lightweight material, and the feel during play. Players found that this set served them well throughout the course and on the driving range, and the set was praised as a great buy for its quality.